There is nothing I love more than a pair of overalls. I’ve been wearing this pair for a few years (as seen here and here). I absolutely LOVE them, but was in the market for something with a bit of a skinnier fit, specifically in the leg, and a slightly lighter wash. After hearing rave reviews about this pair, I decided to try them, and they have quickly become my favorite! For an easy weekend look, I paired them with this super cute linen striped top. I love the color combo (pink and white…my go to lately!) and of course the ruffle sleeves! 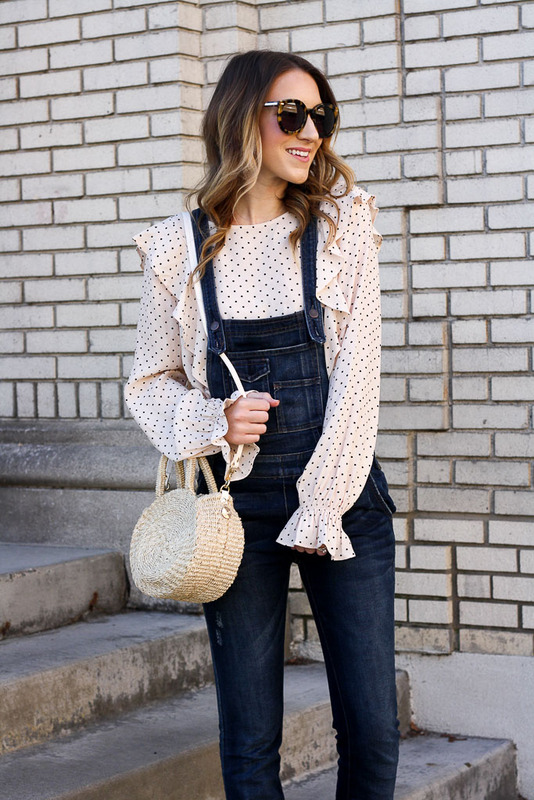 This top is slightly cropped, so I recommend sizing up to pair it with overalls! If you’ve had your eye on this adorable Clare V. bag but haven’t wanted to splurge on this trendy item or haven’t been able to get your hands on one (they have been selling out like crazy! ), I found this dupe that’s only $34! It’s available in tan and black and is the perfect bag to add to your wardrobe for the new season! 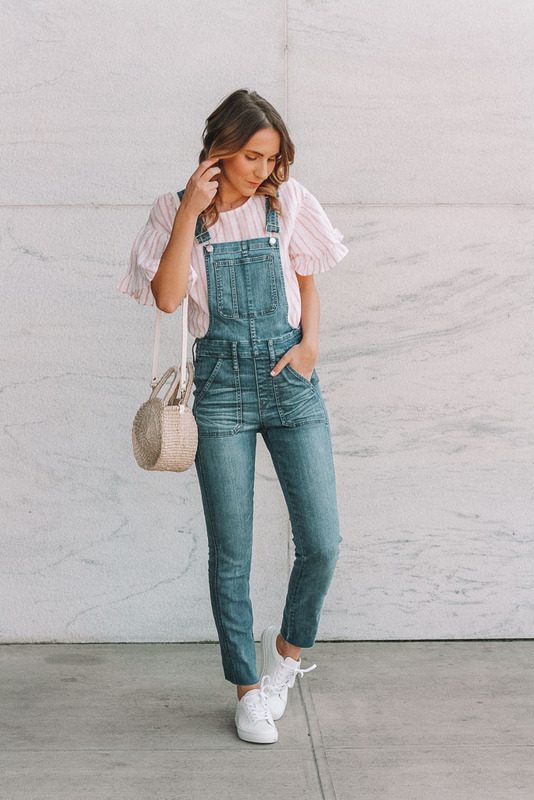 If I had to pick ONE piece of clothing in my wardrobe to name as my all time favorite, it would have to be these overalls. I traveled down a rabbit hole trying to figure out when I first featured them and found this post from 2014, when E, my then boyfriend-now husband, got them for me for my birthday. I have officially been rocking these cuties for 4 YEARS. 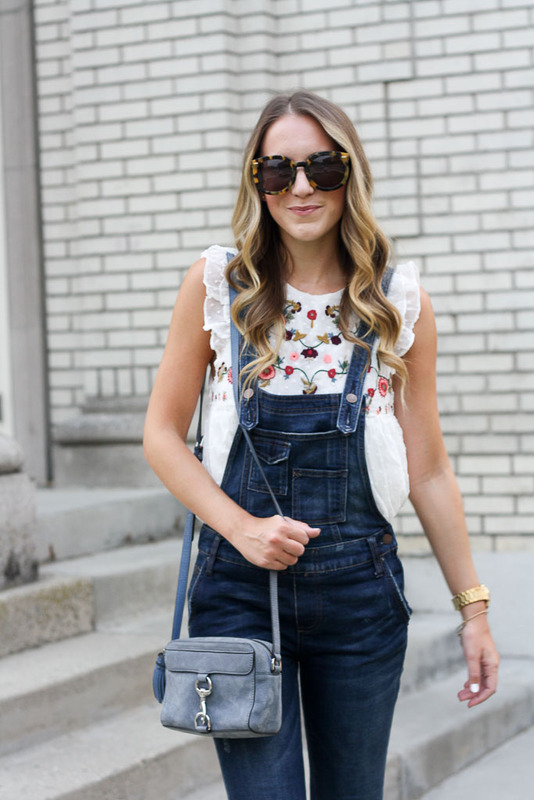 Over the years, I have styled these overalls so many ways (check out a few looks here). They have held up so well, withstanding many washes and wears and they still look brand new! This exact pair is still in stock and now come in a variety of colors and washes (this is the Brady wash). I actually just splurged on this pair, and love the lighter wash and even slimmer fit. 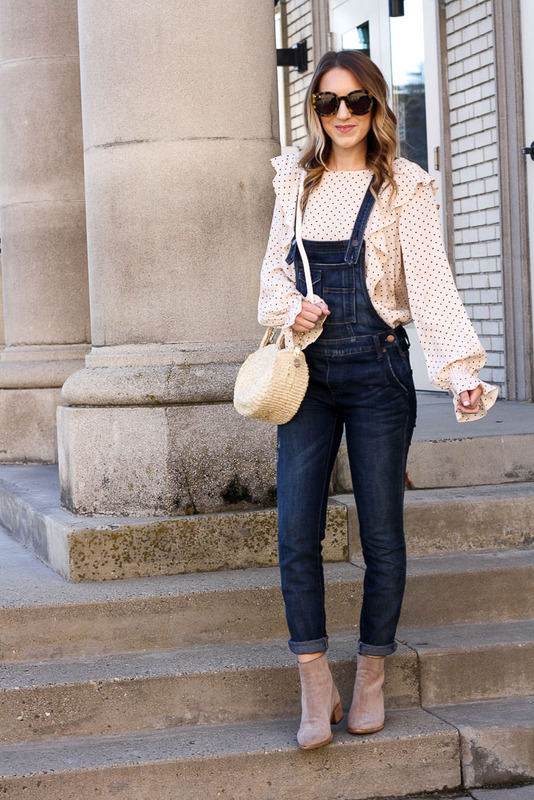 One of my favorite ways to wear overalls is with a ruffley top. I feel like the ruffles add a feminine touch and dress them up a bit. I actually wore this exact combo to work on Valentine’s Day! This top is perfect for work or the weekend and is the prettiest shade of blush! 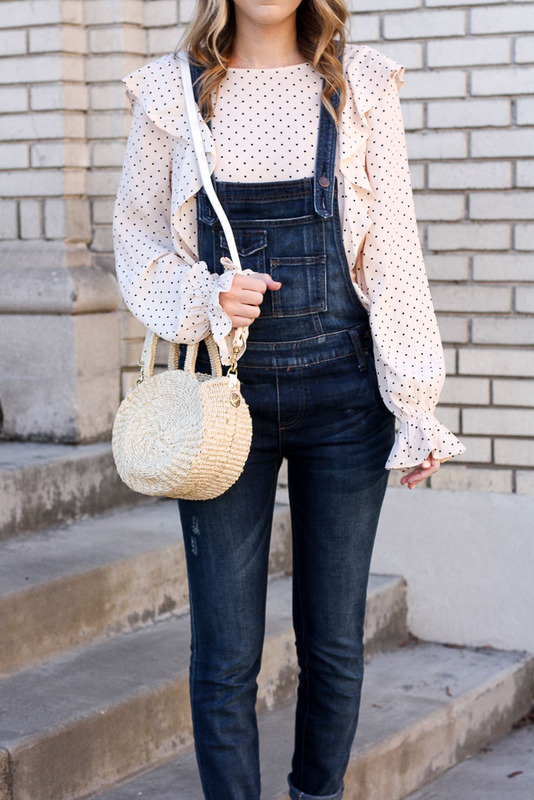 Have you given overalls a chance? If so I would love to see how you styled them! Drop your blog links below! 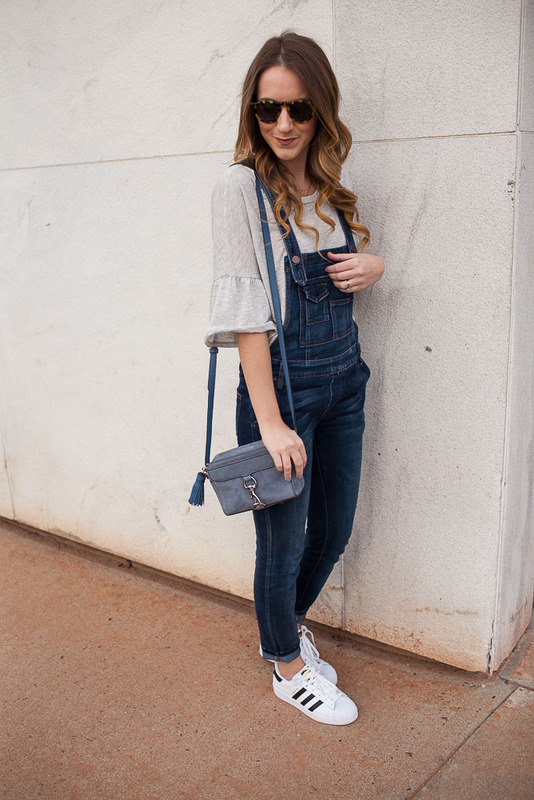 This pair of overalls is one of my closet essentials! I’ve had the same pair for about 3 years and continue to wear them from season to season! If you’ve followed along for awhile, you may have seen them here, here, here, here and here and plenty of other places! Like I said, I wear them from season to season! One way I love to style them in the summer is with a pretty top. 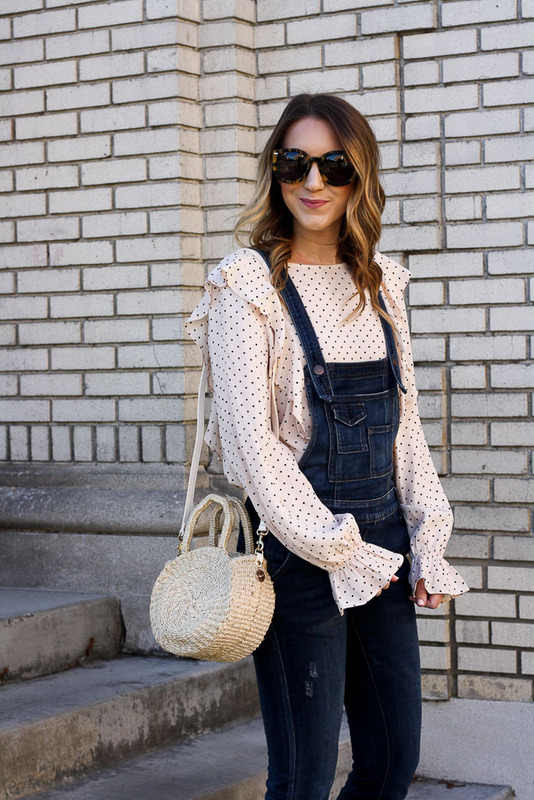 Something with a little ruffle, like this $20 top (a total steal! ), adds the perfect feminine touch. It’s an easy summer look for date night or running errands! 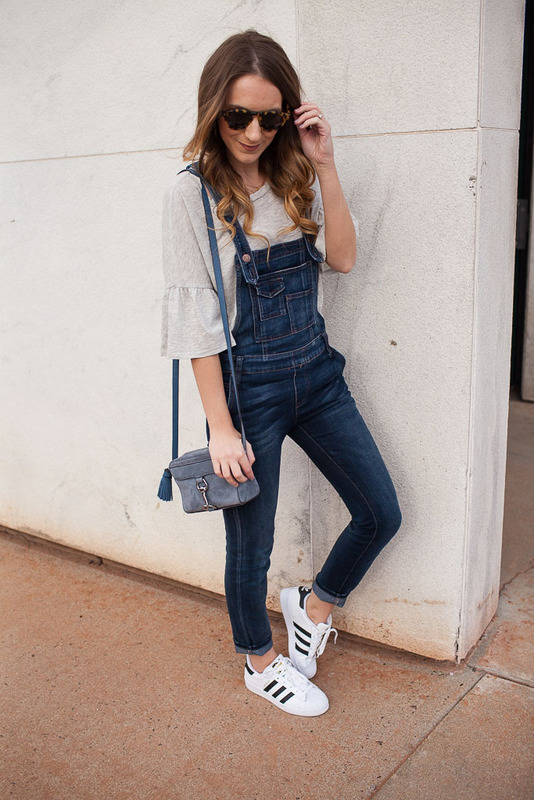 I know everybody has varying opinions on overalls, but I really feel like they should be a closet staple! 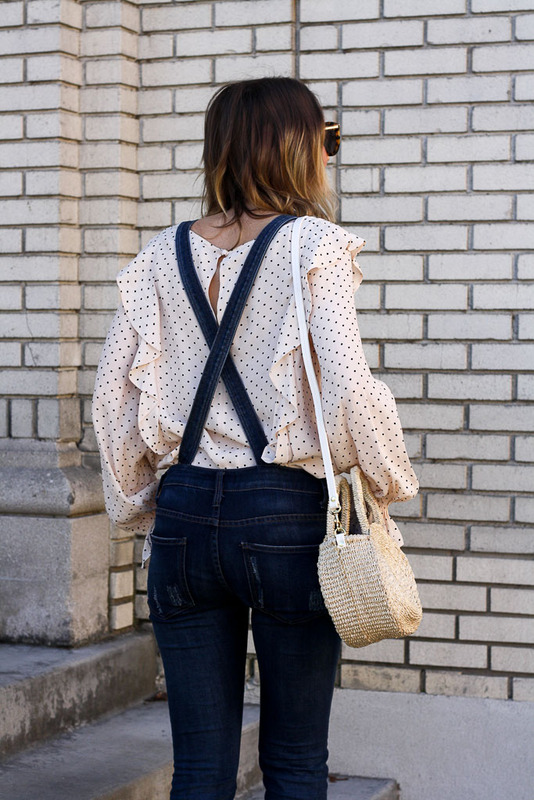 There is nothing easier than throwing on a tee and overalls and heading out the door. 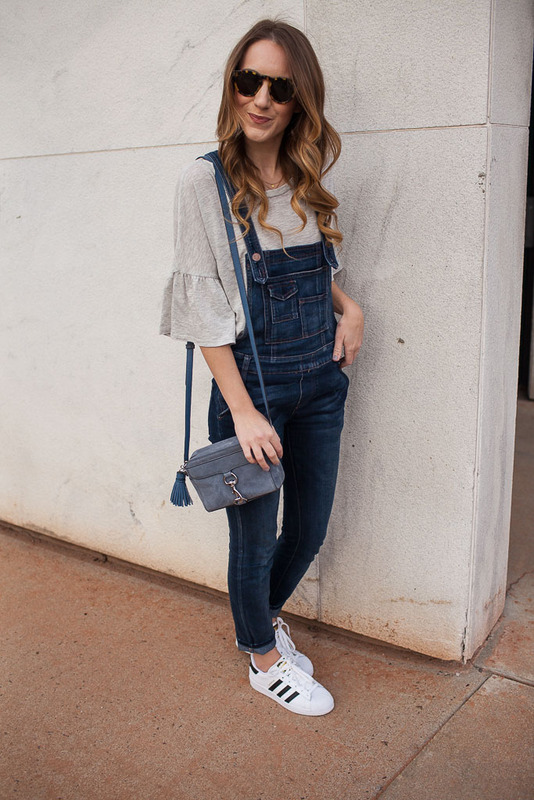 They are cute and effortless and one of my favorite ways to rock denim! For an easy Saturday outing, I paired them with a cute ruffle tee and my favorite sneakers. The ruffle detailing adds a fun feminine touch but is still casual with sneakers. I added a neutral bomber to beat the chilly spring breeze and a blue crossbody for a fun pop of color. 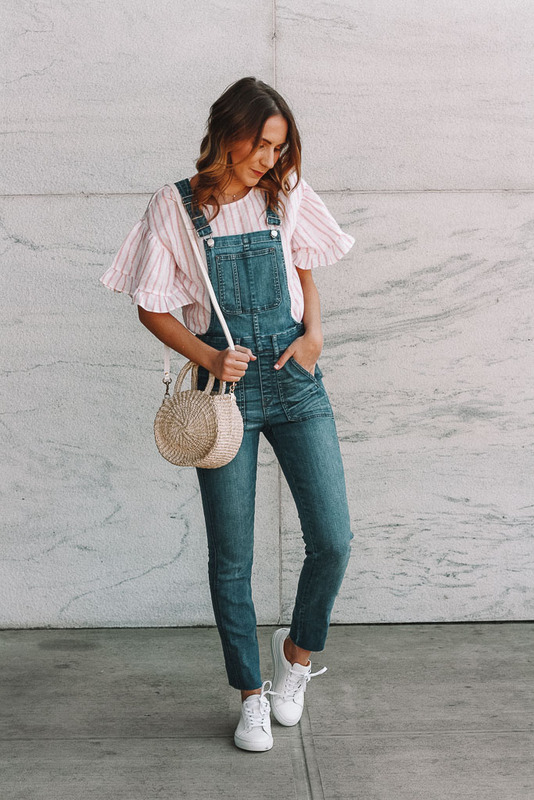 What are your thoughts on overalls? ?